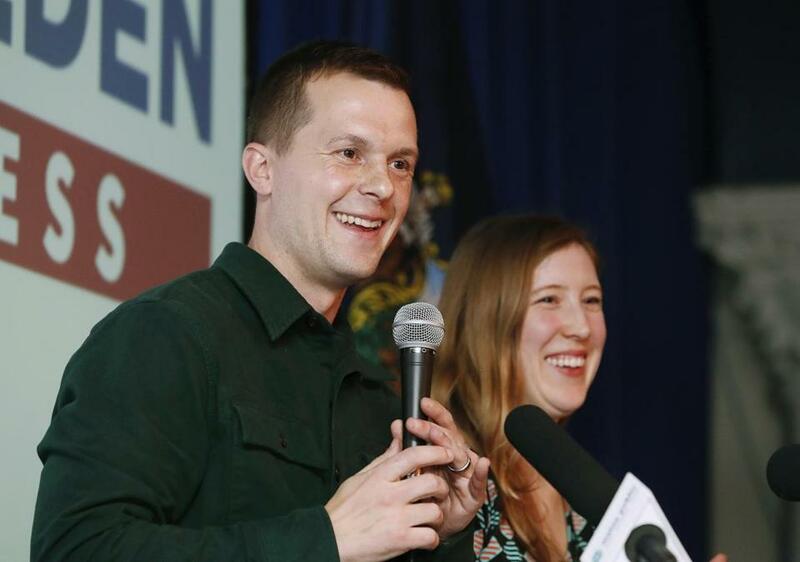 Democrat Jared Golden (left), joined by wife Isobel, speaks to supporters as they wait for results in Maine’s Second Congressional District election, in Lewiston on Nov. 6. Election officials declared Golden the winner Thursday after a federal judge denied Republican Representative Bruce Poliquin’s request to halt tabulations under Maine’s new ranked-choice voting system. Maine is a commonsensical kind of state, with a pragmatic, problem-solving outlook. Its experiment with ranked-choice voting, currently in the news for replacing the preliminary plurality winner with a more broadly popular choice in Maine’s sprawling Second Congressional District, provides a useful electoral reform for other states to imitate. If and when the Pine Tree State’s new vote-tallying method survives a federal court challenge by a beleaguered incumbent, that is. That’s what happened in the Second District. In the initial results, Republican Bruce Poliquin held a lead of 2,632 votes over Democratic nominee Jared Golden, but with two independent candidates in the race, his tally amounted to only 46.4 percent of the vote cast, to 45.5 percent for Golden. 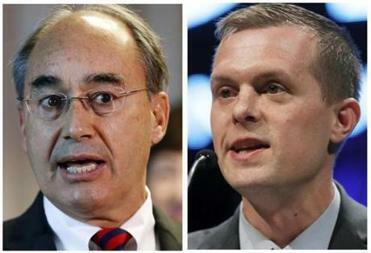 When votes for the two independent candidates were reallocated, Golden had gained more than twice as many new votes as Poliquin. He ended up on top with 139,231 votes to Poliquin’s 136,326, for a victory margin of 2,905 votes. Maine, a state where elections frequently feature one or more independent candidates, has had unfortunate experiences with plurality winners. Combative, divisive Paul LePage first won the governorship in a multi-candidate race with a slender plurality of 37.6 percent, giving him a victory he almost certainly wouldn’t have secured in a head-to-head contest. Because of a Maine constitutional issue, ranked-choice voting governs primaries, but doesn’t apply in general elections for governor or for legislative seats. It is used in all primaries, however, and in general elections for federal offices. Many thoughtful readers had good questions. Other thoughtful readers did not seem to understand ranked-choice voting. So let’s step back and clear a few things up. Read: Could Maine’s new ranked-choice voting change American elections? The possible legal issues with ranked-choice voting aren’t yet fully settled. Before the ranked-choice voting results were tabulated, Poliquin had gone to federal court seeking an injunction to prevent the redistribution of votes. A judge denied that, but the defeated Republican still intends to pursue a federal court challenge to the state law. Although Maine voters have twice embraced ranked-choice voting at the ballot, Poliquin maintains he is only trying to benefit Maine citizens — and oh yes, set an example for children. Still, though his rationale is risible, Poliquin may be doing the cause of ranked-choice voting an unintended favor. This is the first congressional election in the country to be decided by ranked-choice. If other states adopt the system, a legal challenge to ranked-choice voting as it applies to federal elections is all but inevitable, so it may as well come now. If the courts uphold ranked-choice voting, as legal experts expect, that will clear up any uncertainty that might otherwise cloud its attractiveness as an electoral option. Conservatives will of course grouse because, in this instance, ranked-choice resulted in a loss for Poliquin, the last Republican House member in New England. But the Second District will end up with a member of Congress more in sync with its wants. And ranked-choice voting could just as easily work in the GOP’s favor in a contest where right-leaning independents split conservative votes that otherwise would have consolidated around the Republican nominee. Ranked-choice voting isn’t perfect. No system is. But a growing number of cities, from Cambridge to Minneapolis and St. Paul to San Francisco and Oakland, have implemented it. So far, Maine is the only state where it’s used for congressional and statewide elections. Other states would do well to follow Maine’s lead — including Massachusetts.